For other uses, see Willow (disambiguation). "Willow tree" and "Salix" redirect here. For other uses, see Willow Tree (disambiguation) and Salix (disambiguation). 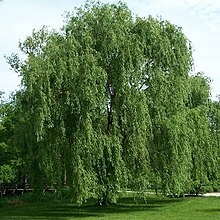 Willows, also called sallows and osiers, form the genus Salix, around 400 species of deciduous trees and shrubs, found primarily on moist soils in cold and temperate regions of the Northern Hemisphere. Most species are known as willow, but some narrow-leaved shrub species are called osier, and some broader-leaved species are referred to as sallow (from Old English sealh, related to the Latin word salix, willow). Some willows (particularly arctic and alpine species) are low-growing or creeping shrubs; for example, the dwarf willow (Salix herbacea) rarely exceeds 6 cm (2.4 in) in height, though it spreads widely across the ground. At the base of the petiole a pair of stipules form. These may fall in spring, or last for much of the summer or even for more than one year (marcescence). Willows all have abundant watery bark sap, which is heavily charged with salicylic acid, soft, usually pliant, tough wood, slender branches, and large, fibrous, often stoloniferous roots. The roots are remarkable for their toughness, size, and tenacity to live, and roots readily sprout from aerial parts of the plant. The leaves are typically elongated, but may also be round to oval, frequently with serrated edges. Most species are deciduous; semievergreen willows with coriaceous leaves are rare, e.g. Salix micans and S. australior in the eastern Mediterranean. All the buds are lateral; no absolutely terminal bud is ever formed. The buds are covered by a single scale. Usually, the bud scale is fused into a cap-like shape, but in some species it wraps around and the edges overlap. The leaves are simple, feather-veined, and typically linear-lanceolate. Usually they are serrate, rounded at base, acute or acuminate. The leaf petioles are short, the stipules often very conspicuous, resembling tiny, round leaves, and sometimes remaining for half the summer. On some species, however, they are small, inconspicuous, and caducous (soon falling). In color, the leaves show a great variety of greens, ranging from yellowish to bluish color. Willows are dioecious, with male and female flowers appearing as catkins on separate plants; the catkins are produced early in the spring, often before the leaves. The staminate (male) flowers are without either calyx with corolla; they consist simply of stamens, varying in number from two to 10, accompanied by a nectariferous gland and inserted on the base of a scale which is itself borne on the rachis of a drooping raceme called a catkin, or ament. This scale is square, entire, and very hairy. The anthers are rose-colored in the bud, but orange or purple after the flower opens; they are two-celled and the cells open latitudinally. The filaments are threadlike, usually pale brown, and often bald. The pistillate (female) flowers are also without calyx or corolla, and consist of a single ovary accompanied by a small, flat nectar gland and inserted on the base of a scale which is likewise borne on the rachis of a catkin. The ovary is one-celled, the style two-lobed, and the ovules numerous. Almost all willows take root very readily from cuttings or where broken branches lie on the ground. The few exceptions include the goat willow (Salix caprea) and peachleaf willow (Salix amygdaloides). One famous example of such growth from cuttings involves the poet Alexander Pope, who begged a twig from a parcel tied with twigs sent from Spain to Lady Suffolk. This twig was planted and thrived, and legend has it that all of England's weeping willows are descended from this first one. Willows are often planted on the borders of streams so their interlacing roots may protect the bank against the action of the water. Frequently, the roots are much larger than the stem which grows from them. Willows have a wide natural distribution from the tropics to the arctic zones and are extensively cultivated around the world. Willows are very cross-compatible, and numerous hybrids occur, both naturally and in cultivation. A well-known ornamental example is the weeping willow (Salix × sepulcralis), which is a hybrid of Peking willow (Salix babylonica) from China and white willow (Salix alba) from Europe. The hybrid cultivar 'Boydii' has gained the Royal Horticultural Society's Award of Garden Merit. 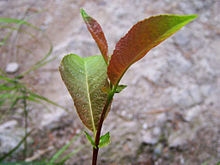 Numerous cultivars of Salix L. have been developed and named over the centuries. New selections of cultivars with superior technical and ornamental characteristics have been chosen deliberately and applied to various purposes. Most recently, Salix has become an important source for bioenergy production and for various ecosystem services. The first edition of the Checklist for Cultivars of Salix L. (willow) was compiled in 2015, which includes 854 cultivar epithets with accompanying information. The International Poplar Commission of the FAO UN holds the International Cultivar Registration Authority (ICRAs) for the genus Salix (willows). The ICRA for Salix produces and maintains The International Register of Cultivars of Salix L. (willow). Willows are used as food plants by the larvae of some Lepidoptera species, such as the mourning cloak butterfly. Ants, such as wood ants, are common on willows inhabited by aphids, coming to collect aphid honeydew, as sometimes do wasps. A small number of willow species were widely planted in Australia, notably as erosion-control measures along watercourses. They are now regarded as invasive weeds which occupy extensive areas across southern Australia and are considered 'Weeds of National Significance'. Many catchment management authorities are removing and replacing them with native trees. Substantial research undertaken from 2006 has identified that willows often inhabit an unoccupied niche when they spread across the bed of shallow creeks and streams and if removed, there is a potential water saving of up to 500 ML/per year per hectare of willow canopy area, depending on willow species and climate zone. This water could benefit the environment or provision of local water resources, especially during dry periods. To aid management of willows, a remote sensing method has been developed to accurately map willow area along and in streams across southern Australia. Willow roots spread widely and are very aggressive in seeking out moisture; for this reason, they can become problematic when planted in residential areas, where the roots are notorious for clogging French drains, drainage systems, weeping tiles, septic systems, storm drains, and sewer systems, particularly older, tile, concrete, or ceramic pipes. Newer, PVC sewer pipes are much less leaky at the joints, and are therefore less susceptible to problems from willow roots; the same is true of water supply piping. Willow species are hosts to more than a hundred aphid species, belonging to Chaitophorus and other genera, forming large colonies to feed on plant juices, on the underside of leaves in particular. Corythucha elegans, the willow lace bug, is a bug species in the family Tingidae found on willows in North America. Rust, caused by fungi of genus Melampsora, is known to damage leaves of willows, covering them with orange spots. 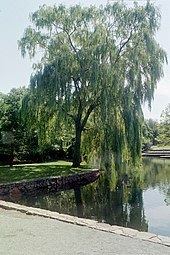 The leaves and bark of the willow tree have been mentioned in ancient texts from Assyria, Sumer and Egypt as a remedy for aches and fever, and in Ancient Greece the physician Hippocrates wrote about its medicinal properties in the fifth century BC. Native Americans across the Americas relied on it as a staple of their medical treatments. It provides temporary pain relief. Salicin is metabolized into salicylic acid in the human body, and is a precursor of aspirin. In 1763, its medicinal properties were observed by the Reverend Edward Stone in England. He notified the Royal Society, which published his findings. The active extract of the bark, called salicin, was isolated to its crystalline form in 1828 by Henri Leroux, a French pharmacist, and Raffaele Piria, an Italian chemist, who then succeeded in separating out the compound in its pure state. In 1897, Felix Hoffmann created a synthetically altered version of salicin (in his case derived from the Spiraea plant), which caused less digestive upset than pure salicylic acid. The new drug, formally acetylsalicylic acid, was named Aspirin by Hoffmann's employer Bayer AG. This gave rise to the hugely important class of drugs known as nonsteroidal anti-inflammatory drugs (NSAIDs). Some of humans' earliest manufactured items may have been made from willow. A fishing net made from willow dates back to 8300 BC. Basic crafts, such as baskets, fish traps, wattle fences and wattle and daub house walls, were often woven from osiers or withies (rod-like willow shoots, often grown in coppices). One of the forms of Welsh coracle boat traditionally uses willow in the framework. Thin or split willow rods can be woven into wicker, which also has a long history. The relatively pliable willow is less likely to split while being woven than many other woods, and can be bent around sharp corners in basketry. Willow wood is also used in the manufacture of boxes, brooms, cricket bats, cradle boards, chairmans and other furniture, dolls, flutes, poles, sweat lodges, toys, turnery, tool handles, veneer, wands and whistles. In addition, tannin, fibre, paper, rope and string can be produced from the wood. Willow is also used in the manufacture of double basses for backs, sides and linings, and in making splines and blocks for bass repair. Agriculture: Willows produce a modest amount of nectar from which bees can make honey, and are especially valued as a source of early pollen for bees. 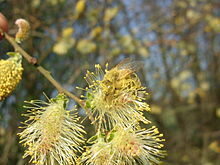 Poor people at one time often ate willow catkins that had been cooked to form a mash. Art: Willow is used to make charcoal (for drawing) and in living sculptures. Living sculptures are created from live willow rods planted in the ground and woven into shapes such as domes and tunnels. Willow stems are used to weave baskets and three-dimensional sculptures, such as animals and figures. Willow stems are also used to create garden features, such as decorative panels and obelisks. Energy: Willow is grown for biomass or biofuel, in energy forestry systems, as a consequence of its high energy in-energy out ratio, large carbon mitigation potential and fast growth. Large-scale projects to support willow as an energy crop are already at commercial scale in Sweden. Programs in other countries are being developed through initiatives such as the Willow Biomass Project in the US, and the Energy Coppice Project in the UK. Willow may also be grown to produce charcoal. Environment: As a plant, willow is used for biofiltration, constructed wetlands, ecological wastewater treatment systems, hedges, land reclamation, landscaping, phytoremediation, streambank stabilisation (bioengineering), slope stabilisation, soil erosion control, shelterbelt and windbreak, soil building, soil reclamation, tree bog compost toilet, and wildlife habitat. Religion: Willow is one of the "Four Species" used ritually during the Jewish holiday of Sukkot, or the Feast of Tabernacles, cited in Leviticus 23:40. In Buddhism, a willow branch is one of the chief attributes of Kwan Yin, the bodhisattva of compassion. Christian churches in northwestern Europe and Ukraine and Bulgaria[better source needed] often used willow branches in place of palms in the ceremonies on Palm Sunday. The willow is one of the four species associated with the Jewish festival of Sukkot, or the Feast of Tabernacles, cited in Leviticus 23:40. Willow branches are also used during the synagogue service on Hoshana Rabbah, the seventh day of Sukkot. "...I will be the willow on your bedside." In English folklore, a willow tree is believed to be quite sinister, capable of uprooting itself and stalking travellers. The Viminal Hill, one of the Seven Hills of Rome, derives its name from the Latin word for osier, viminia (pl.). Hans Christian Andersen wrote a story called "Under the Willow Tree" (1853) in which children ask questions of a tree they call "willow-father", paired with another entity called "elder-mother". "Green Willow" is a Japanese ghost story in which a young samurai falls in love with a woman called Green Willow who has a close spiritual connection with a willow tree. "The Willow Wife" is another, not dissimilar tale. "Wisdom of the Willow Tree" is an Osage Nation story in which a young man seeks answers from a willow tree, addressing the tree in conversation as 'Grandfather'. The Whomping Willow is featured throughout the Harry Potter series, most notably as a guardian for a backdoor entrance to the Shrieking Shack. This is especially important in the third and seventh installments of the series, Harry Potter and the Prisoner of Azkaban and Harry Potter and the Deathly Hallows respectively. In Central Europe a "hollow willow" is a common figure of speech, alluding to a person one can confide secrets in. The metaphor was used e.g. in the poem Král Lávra (King Lear) by Czech poet Karel Havlíček Borovský (1854). Willow is considered the national tree of Ukraine. Sail, Ogham letter meaning "willow"
^ a b c Mabberley, D.J. 1997. The Plant Book, Cambridge University Press #2: Cambridge. ^ George W. Argus (1986). The Genus Salix (Salicaceae) in the Southeastern United States. Systematic Botany Monographs. 9. American Society of Plant Taxonomists. pp. 1–170. doi:10.2307/25027618. ISSN 0737-8211. JSTOR 25027618. ^ Leland, John (2005). Aliens in the Backyard: Plant and Animal Imports Into America. University of South Carolina Press. p. 70. ISBN 978-1-57003-582-1. ^ Laird, Mark (1999). The Flowering of the Landscape Garden: English Pleasure Grounds, 1720-1800. University of Pennsylvania Press. p. 403. ISBN 978-0-8122-3457-2. 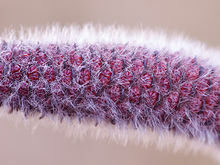 ^ "RHS Plant Selector – Salix 'Boydii'". Retrieved 2 June 2013. ^ "Mourning Cloak". Study of Northern Virginia Ecology. Fairfax County Public Schools. ^ Albury/Wodonga Willow Management Working Group (December 1998). "Willows along watercourses: managing, removing and replacing". Department of Primary Industries, State Government of Victoria. ^ Cremer, Kurt W. (2003). "Introduced willows can become invasive pests in Australia" (PDF). ^ Doody, Tanya; Benyon, Richard (2011). "Quantifying water savings from willow removal in Australian streams". Journal of Environmental Management. 92 (3): 926–935. doi:10.1016/j.jenvman.2010.10.061. PMID 21106290. ^ Doody, Tanya; Nagler, Pamela; Glenn, Edward; Moore, Georgianne; Morino, Kiyomi; Hultine, Kevin; Benyon, Richard (2011). "Potential for water salvage by removal of non-native woody vegetation from dryland river systems". Hydrological Processes. 25 (26): 4117–4131. Bibcode:2011HyPr...25.4117D. doi:10.1002/hyp.8395. ^ Doody, Tanya; Benyon, Richard; Theiveyanathan, S; Koul, Vijay; Stewart, Leroy (2013). "Development of pan coefficients for estimating evapotranspiration from woody vegetation". Hydrological Processes. 28 (4): 2129–2149. Bibcode:2014HyPr...28.2129D. doi:10.1002/hyp.9753. ^ Doody, Tanya; Lewis, Megan; Benyon, Richard; Byrne, Guy (2013). "A method to map riparian exotic vegetation (Salix spp.) area to inform water resource management". Hydrological Processes. 28 (11): 3809–3823. Bibcode:2014HyPr...28.3809D. doi:10.1002/hyp.9916. ^ Blackman, R. L.; Eastop, V. F. (1994). Aphids on the World's Trees. CABI. ISBN 9780851988771. ^ David V. Alford (2012). Pests of Ornamental Trees, Shrubs and Flowers. p. 78. ISBN 9781840761627. ^ Kenaley, Shawn C.; et al. (2010). "Leaf Rust" (PDF). ^ "An aspirin a day keeps the doctor at bay: The world's first blockbuster drug is a hundred years old this week". Retrieved 9 June 2007. ^ W. Hale White. "Materia Medica Pharmacy, Pharmacology and Therapeutics". Retrieved 2 April 2011. ^ Mola-Yudego, Blas; Aronsson, Pär. (2008). "Yield models for commercial willow biomass plantations in Sweden". Biomass and Bioenergy. 32 (9): 829–837. doi:10.1016/j.biombioe.2008.01.002. ^ "Forestresearch.gov.uk". Forestresearch.gov.uk. Retrieved 18 December 2011. ^ Guidi Nissim W., Jerbi A., Lafleur B., Fluet R., Labrecque M. (2015) "Willows for the treatment of municipal wastewater: long-term performance under different irrigation rates". Ecological Engineering 81: 395–404. doi:10.1016/j.ecoleng.2015.04.067. ^ Guidi Nissim W., Voicu A., Labrecque M. (2014) "Willow short-rotation coppice for treatment of polluted groundwater". Ecological Engineering, 62:102–114 doi:10.1016/j.ecoleng.2013.10.005. ^ "ChurchYear.net". ChurchYear.net. Retrieved 18 December 2011. ^ Doolittle, Justus (2002) . Social Life of the Chinese. Routledge. ISBN 978-0-7103-0753-8. ^ "The Forest of Willows in Our Minds". Arirang TV. 20 August 2007. Retrieved 10 September 2007. ^ "In Worship of Trees by George Knowles: Willow". ^ "Mythology and Folklore of the Willow". ^ "Under The Willow Tree". Hca.gilead.org.il. 13 December 2007. Retrieved 18 December 2011. ^ "Green Willow". Spiritoftrees.org. Retrieved 18 December 2011. ^ "Wisdom of the Willow Tree". Tweedsblues.net. Archived from the original on 29 September 2011. Retrieved 18 December 2011. ^ English Names for Korean Native Plants (PDF). Pocheon: Korea National Arboretum. 2015. p. 617. ISBN 978-89-97450-98-5. Archived from the original (PDF) on 25 May 2017. Retrieved 22 December 2016 – via Korea Forest Service. Keeler, Harriet L. (1990). Our Native Trees and How to Identify Them. New York: Charles Scriber's Sons. Pages 393–395. ISBN 0-87338-838-0. Look up willow, sallow, withy, or osier in Wiktionary, the free dictionary. "Willow" . Encyclopædia Britannica. 28 (11th ed.). 1911. pp. 688–689. "Willow" . The New Student's Reference Work . 1914. This page was last edited on 25 March 2019, at 16:43 (UTC).